Right off the bat - my weekend was kewl, at least from the general assessment I've been able to make, just kewl. Friday - totally FAB, went to a jazz and comedy night program at my friend's church and I so enjoyed myself. Although earlier during the day I was kinda ticked off after being stuck in traffic for only God knows how long. Geez can they (whoever they are) stop with all the construction already? Saturday was... nyeh. Went to a wedding, was alright but I had to go through one of those useless rubbish nonsense I usually refer to. Don't worry, it's not even worth it right now *HISS* Anywhoo so was able to catch most of the church ceremony; trust Nigerians now... and then reception. Kai, see disorganization ehn? Like my mom and I were saying - it's the little details that count o (and of course the right people helping you). All the same, lessons learned. Saw some friendly familiar faces I hadn't seen in a while. Said the his and how you doings, smiled, hugges, complimented, and then the take care and I'll see you laters. And then the bad taste in my mouth! OMG why now, I mean I know this city (even as huge as it is) isn't big enough especially when it comes to weddings but why today. Took that as my clue and decided the whole show was over for me anyway; just didn't feel like pretending some more, I'd done enough pretending at the church anyway - re: my useless rubbish nonsense. Yesterday, Sunday was great too of course. After I was semi-successful with my ignoring strategy for you-don't-know-who, I went off to SS class to go welcome fresh kids to start off another school year. I'm quite certain that you-don't-know-who will start realizing what's going on very soon. Getting a taste of your own poison can't be that sweet so I'm sure you-don't-know-who will get the drift. Anywhoo class went well, I think this upcoming school year will go great and better than expected but hey KNOCK ON WOOD! I'm not trying to jinx anything here before June even picks up lol. Alrighty people, I'm on a mission!!! I said I'm on a mission o and for real, I don't plan on taking this lightly or brush it aside anymore. What's my mission you ask? I'm on a serious mission to learn Yoruba, my native language. Yeah I'll wait for y'all to get done laughing very well. Doesn't move me o afterall I get it all the time - "what? what do you mean you don't know your language?" Umm did I stutter? I said I understand it but just don't know how to speak it very well. Actually lemme throw in my disclaimer right now. It's not like I don't know how to speak it, it's just that I don't trust myself enough to have a complete conversation with someone else in Yoruba. Can you imagine? Does that even make any sense at all? However I know what I'm talking about cause there was this one time at my former job when security called my office asking me to come downstairs and assist someone. Lo and behold it was an elderly lady who was looking for her daughter and the woman spoke nothing but only Yoruba. What da? In this America ke? No small small English at all, not even broken English! If you see the way I looked at the officer and nearly "blessed" him out of the building ehn. Instead I smiled and I know he could tell how hesitant I was but my peeps, come and see my survival skills kicking in immediately!!! Me ke? Why would I want this woman to see me as an "aje butter" who "doesn't appreciate where she comes from and can't represent amongst the oyinbos". Okay so yeah yeah that's not exactly what she said but puh-lease, y'all know how all these elderly think now. Am I the only paranoid person? Anywhoo I got through the whole ordeal in one piece, the lady was nothing but grateful from beginning to end, and I actually went back to thank the officer for figuring she was Nigerian and calling on me. I turned around and took it as a compliment plus it made me learn and realize something. That I am just afraid to speak my language all because it is not the norm for me. God is in control sha! 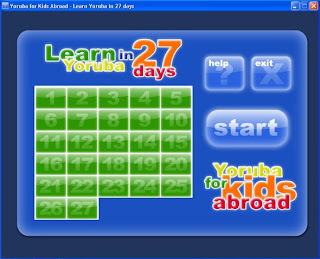 So the closest to what I really want is the Learn Yoruba Software which by the way, is on my wishlist hehehehe. I'm not trying to push anything, just wishing. Ask and ye shall receive right? I've experienced it here on blogville already so whatever. What I really want is a CD that I can practice more with. You know, I can just pop that into my car player and be on the go. Wouldn't that be so cool? Be on the move from one place to another and honing my language skills? Too crazy! I think it'll be better than the software where I'd have to be stationed in front of a PC or laptop. Please, please, please if anyone knows where I can purchase such product, be kind to at least lemme me know sharpish. I know it exists cause I've been told it exists. Unless I wasn't really pasying attention like I thought I was. This Yoruba language I must conquer fast fast before I run into anymore disgrace! Yes o, it is by force!!! lol Happy Monday and enjoy the rest of the week everyone. Thanks sha for providing that website! That was actually one of the first websites I checked out and just like the rest, it's a PC software. Nothing for a CD player. Argh... I just might have to go with one of those. Thanks again! i'm so impressed u want to know more about ur roots via learning the yoruba language. Who is "you-don't-know-who" o? Me...i don't know o! Ah-ha...there was a time I couldn't speak much yoruba too but after years of living among yoruba speakers, it came naturally. So if you spend time amongst people who speak yoruba, that could help. You may try googling it too, am sure if one can find how to cook ewedu on google, one is sure to find how to speak yoruba. Reminds me of a jamo girl in my work place dating this nija dude. She went on the net to find yoruba names that she likes and she found loads. Guess the one she liked most? Ige. I couldn't stop laughing. Anyway gurl good luck with your yoruba speaking mission. Awww... ya'll thanks for the virtual love and support!!! @ folayemi - e ma binu o, mo ro pe e busy ni... hahaha! Did I pull it off? Mehn speaking is one thing and typing/writing is a whole diff ball game. God dey! You-don't-know-who is someone who upset me a while back; intentionally too. @ parakeet - girl you must be like the 19th person who's telling me that o. Abi am I not hanging wround yoruba people enough? I trust google! Thanks girlie.